Getting up early on a Sunday never feels like a good idea to me. It's the one time during the week when I can emerge slowly, read a little in bed, savour my first cup of coffee of the day and indulge in some Monty Don worship watching the repeat of Gardeners World. So driving myself to the other side of Leeds at 830am to meet strangers in a car park wasn't really top of the list of things I wanted to do. But there I found myself, joining a Foraging and Wild Food Cooking Day with Lisa from Edulis Wild Food. 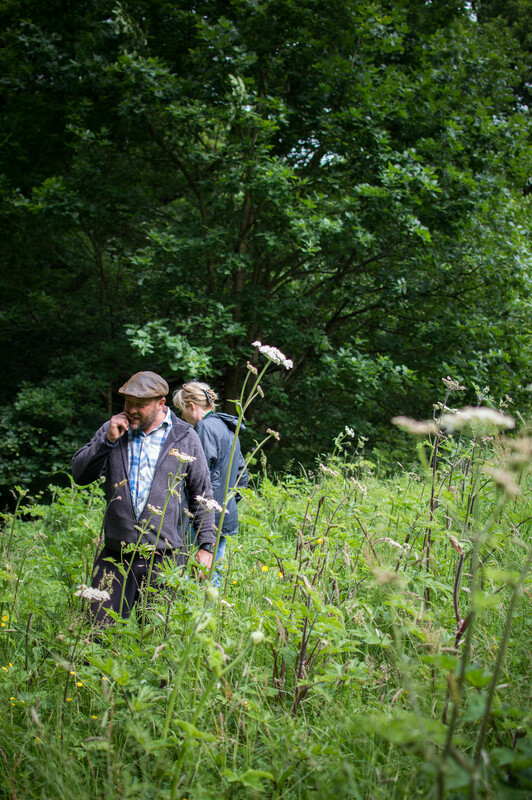 The morning was to be spent foraging in the woods before moving on to Get Cooking, a new cookery school based in Farsley and where we would be using our wild food finds to make several dishes. Like most people who are interested in foraging I know a little about what to eat and what not to eat. I pick mostly sloes, wild raspberries and elderflowers (all of which tend to find themselves in a bottle of gin or vodka!) as well as a few edible flowers and I always stay clear of fungi as I am utterly clueless about it. Starting off our walk through Meanwood Park, I got chatting to a lovely lady called Sandra who gave me a great tip about saving the sloes after making gin and then coating them in chocolate for an indulgent, boozy treat. Guess what I'll be doing for Christmas? Oh yes. There were six of us on the foraging walk, some with more knowledge than others, but all keen to learn a whole lot more. 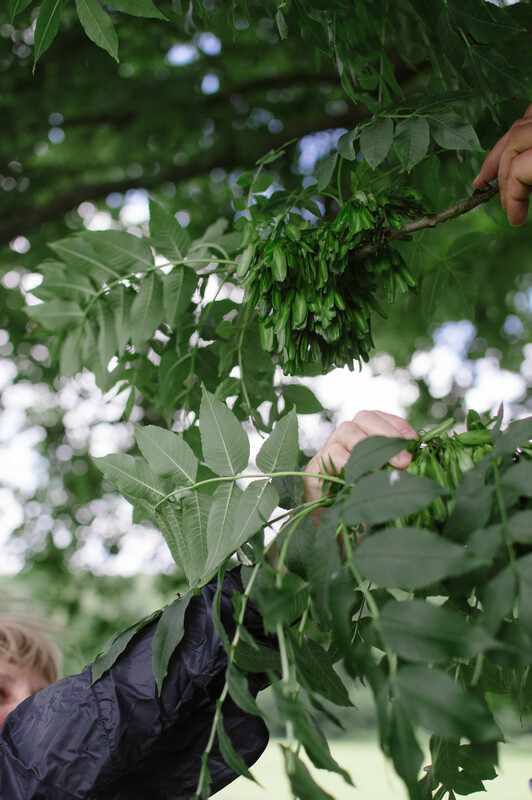 Our teacher, Lisa Cutcliffe, originally from Winchester, has been a keen forager since she was a child, learning from her parents and grandparents about the natural world, before heading off to study Biology at Leeds University. Interested in gardening, vegetable growing and cookery she found herself watching a television show about porcini mushrooms growing in the wild in the UK and decided to try and seek them out. It took a couple of years before she found what she was looking for, but during her quest she discovered a real love of wild food which has since led her to educating others about what can and cannot be eaten. Leeds is now her permanent home and she teaches classes here and all over the UK*. The sun was shining as we started our walk and we'd barely left the car park before we were discovering our first edibles - ash keys. Hanging in great clusters like bunches of grapes from ash trees, Lisa taught us they need to be picked very young otherwise they become too tough and fibrous as they age. We were going to be pickling them alongside other wild greens so we gathered a few to take back with us. A little further along the path we also found beautiful flowers and flavours from the green alkanet plant, which is related to the borage family and although called green, the flower is a very vivid shade of blue (top right image in detail). These were also picked to use as an edible addition to a goats cheese we were going to be preparing. Heading into deep woodland, we were looking to find some fungi alongside the wild greens. Autumn is when fungi is at its most abundant, but there are some varieties that show themselves in the Summer. Lisa was keen to show us the chicken-in-the-woods mushroom, a bright yellow and orange fungi, and some were spotted in trees but up too high to be able to get to them. Taking us to a tree she knew was usually very productive and at a height that was reachable, Lisa was sorry to point out that it had been stripped by other foragers (left image). We were lucky to get to taste some later as she had kindly harvested some the day before for us to try back at the cookery school. It has a flavour and texture very much like chicken and it's great for adding to soups and stir fries. Lisa had made them into pakora, which were out of this world good. Next on the fungi trail was the discovery of a witch's egg or immature common stinkhorn. (above right) The jelly part needs to be scraped off and then the centre is edible. As Lisa was showing the group and cutting it up to share, I checked my phone as it was on silent and noticed that Harry had made several "emergency calls" to me. Having no signal, I began to panic a little, worried that something had happened at home. Finally I got through and was told, 'I've completed my homework and can I have a biscuit?'. Typical teenage idiocy which meant I missed the tasting session! But the others said it was delicious. Like all fungi, stay away from it if you are not experienced in identification, there are too many similar looking ones that are highly toxic. It's also worth googling the mature common stinkhorn if you like your giggles of the Carry On variety. We did find one, but I couldn't bring myself to photograph it! We also stumbled upon the very cute, almost fairy tale like horsehair fungus, which is not edible, but looks so pretty I had to photograph it. (below left). Heading out of the deep woodland, we came upon a bright, sunny meadow full of buttercups, cow parsley, wild mint and hogweed. We were picking the small flower buds of the common hogweed to use in a wild greens frittata. Lisa advised us of the serious problems that common hogweed can lead to as its sap can increase photosensitivity where it contacts the skin. It can then cause dark pigmentation and even blisters when affected areas are exposed to sunlight. Likewise, the non-native giant hogweed is even more potent and can lead to people having serious burns and sensitivity can last for years. We carefully picked the buds whilst they were tight and unopened and Lisa also pulled a couple that had opened, removing the casing, and revealing the tightly packed flower heads. They resemble purple sprouting broccoli and even taste a little of that flavour. They are really delicious and I think were my favourite thing that I tried all day. We also learned how to identify other umbillifiers including the very dangerous, hemlock water dropwort. We picked lots of other wild greens too, small wild garlic leaves which were more difficult to find as they are coming to the end of the season, wood sorrel and jack-by-the-hedge. Then we returned to our cars and headed to the cookery school for some lunch and to start turning our wild food into some stunning culinary creations. Get Cooking is based in Springfield Commercial Centre, a redeveloped mill over in Farsley, Leeds and has recently opened offering a wide variety of day and evening classes. It's a bright, airy and modern cookery school with a laid back rustic feel. Owner and teacher Emily also sells one or two pieces of vintage furniture (including this Ercol daybed below left, swoon!) and handmade cushions and lampshades from local artisans. I've known Emily for several years through mutual friends and I know how hard she has worked to fulfill her dream of opening the school. She is passionate about sharing her love of food and working with other local cooks and teachers. So you'll find classes in seasonal baking led by the Travelling Tea Ladies, healthy eating with a qualified nutritionist, Asian vegetarian cookery, bread making and even summer school classes for the kids. It would be a great place for events or celebrations, perhaps a hen party gathering or an office and team building opportunity. Courses can be found here and I rather fancy the craft beer one. How good would it be to have your own micro-brewery in the garden shed? We were all hungry and in need of a little rest after our busy morning foraging. Lisa had provided us with a lovely lunch, much of it foraged, including those chicken-in-the-woods pakora and her wild greens goats cheese which we would be making a little later. There were also tasters of her foraged berry vinegars and pickles. I was most impressed with that stunning elderflower cordial and lemon drizzle cake with lilac flowers, so pretty and unbelievably delicious to eat (it's always about the cake for me, no matter where I am!). We all enjoyed chatting around the table, finding out a little more about Lisa and other things to forage at other times of the year. And then we got cooking! First up was foraged blackberry meringues (the berries had been picked last season and frozen, Lisa brought them with her). I'd never attempted meringues before and was a bit apprehensive about them as I believed they could be temperamental. The method was really straightforward and they looked pretty good going into the oven. Unfortunately my oven wasn't set high enough so they didn't cook! Lisa wrapped them up so I could take them home to try and finish them off in my own oven, but alas, they stuck to the paper so it wasn't to be. I've since tried the recipe at home, making one big pavlova instead of individual meringues and it was a big hit. (At the bottom of the page is a picture of Lisa's meringues, the berries get swirled through the egg white with a cocktail stick and they look amazing). I was so busy cooking that I didn't want to keep stopping to pick up my camera otherwise I'd have fallen behind everyone else and there was a lot to learn. Next on the list was the goats cheese, which was made with lemon instead of animal rennet. We each heated up a carton of goats milk until boiling point, then added lemon juice and stirred until the curds and whey were separated. The mixture was then poured into a muslin cloth and hung to allow the separation to continue. Once drained, we unwrapped our cheese and I added freshly chopped wild garlic leaves, walnuts, seasoning as well as a few thyme leaves that were in a pot in the cookery school. The cheese is then reshaped in the muslin cloth (and rinsed in between use) before you lay out your design (upside down) to make it all super pretty. 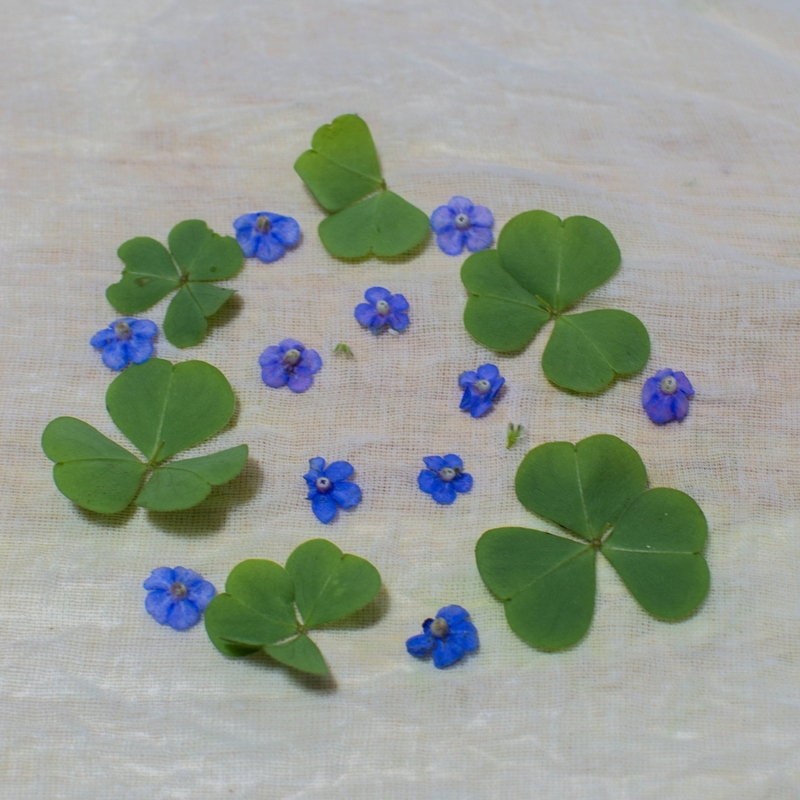 I used a combination of wood sorrel leaves and the green alkanet flowers to decorate. It tastes beautiful but I used a lot less wild garlic than the others as I'm not a garlic lover. I'd definitely make this again as it was easy, really tasty and it's just so pretty. It keeps for a couple of days wrapped in the fridge, but it's not around long enough really for that to happen! Our final dish of the afternoon was a new potato, wild mushroom and wild greens frittata. Again I didn't get a chance to photograph mine as I was too busy making it. But I've pictured Lisa's below and it looks so beautiful with the addition of those chive flowers. Lisa brought some wild mushrooms she'd foraged from the day before so we were all able to try some different varieties and add them to the frittata. Using the flower buds from the common hogweed, Lisa advised us to lightly saute them (which I did, then tasted and oh my word. they are so good) then add them right at the end. I took mine home and ate it for breakfast the next day. Yum. We finished a little after 5pm, tired but happy. 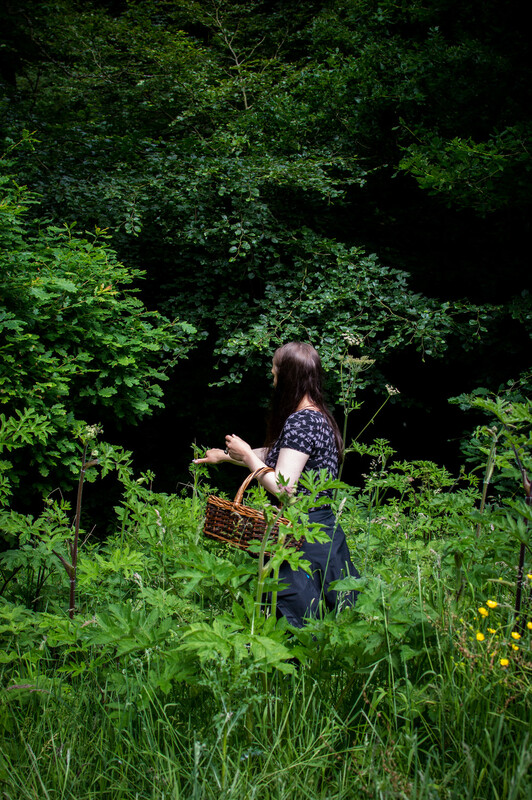 I came away knowing a lot more about foraging than when I started yet there is so much more to learn and that's really exciting to me as someone who loves to eat seasonally and cook with fresh ingredients. I'll definitely be continuing with my foraging journey. I started my day thinking about how I wished I was still in my pyjamas, sipping coffee and indulging in my other morning rituals, yet it ended with me feeling super glad I went on this foraging adventure. So this Sunday, instead of loafing around, you'll find me with my vintage basket, roaming the woods and searching for weeds to eat....... #eatyourweeds. A huge thank you to Lisa and Emily for inviting me to join them on the Foraging and Wild Food Day with Get Cooking, Leeds. All photographs taken by me except the last two which are by Lisa and from her Instagram feed. Get Cooking! can be found on Facebook here and course details are on the website, here. I'd seriously recommend you follow Lisa of Edulis over on Instagram where you will see some of the prettiest plates of food I've ever seen! Lots of beautiful dishes made with foraged finds and edible flowers. This pancake one makes me drool! You can also find Lisa on Facebook. Autumn course dates coming soon.